Happy Birthday America and Happy Fourth of July to You All! — Nicky Smith, DigitalPhone.io Founder, CEO and Patriot! GREENSBORO, NC, UNITED STATES, July 3, 2018 /EINPresswire.com/ -- Birthdays are associated with parties, cakes, and gifts. But at the heart of every birthday celebration — small or big — is an expression of something very powerful and special: gratitude. That’s because we aren’t just saying “happy birthday” to a family member, neighbor, friend or colleague. At the heart of it, we’re saying THANK YOU for being a part of our lives. 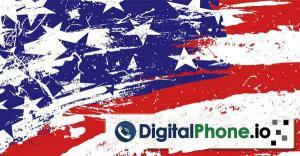 Well, today on behalf of the DigitalPhone.io team — including our family members who support us each day — I’d like to take this opportunity to say HAPPY BIRTHDAY and THANK YOU to the United States of America. DigitalPhone.io was born almost 20 years ago right here in Greensboro, North Carolina. And while we now have a national footprint and serve customers in many states, we are extremely proud of our community roots, and for our legacy of creating high quality, permanent jobs right here at home. We believe in America — always have, and always will! Now, if you’re expecting me to go on some political rant here about my political opinions, then that’s not going to happen. Yes, I have strong — and informed — views about what I think our country is doing right, and what I think our country is doing wrong (and if you know me personally, then I’m sure you already know what these are, anyway!!!). But what is more important to me than what we need to fix, is who we are together: we are all part of the greatest country in the history of the world. Even while we deal with some major issues — and we absolutely need to deal with them! — people from around the world are literally risking their lives just to get here. That tells you something, doesn’t it? Don’t let anyone tell you that the spirit and vision that took us from a colony to the most powerful country in the world in less than 200 years (!!!) is dead and buried. That is total BS. The American Dream more alive than it ever was, because no matter what our differences are, we are all Americans. Will fixing our problems be easy? No it won’t. But so what? As always, we will roll up our sleeves, rise to the challenge, and solve any problem. That’s that we do. And anyone who thinks otherwise — inside our borders or outside — is going to get a very shocking reminder. As history has shown time and time again, while we don’t go around starting fights, but we sure as hell finish them. Winning isn’t just something we do. It’s who we ARE. DigitalPhone.io Founder, CEO and Patriot!